Kiwi songwriter Rachel Dawick is pleased to announce the release of her new single, Biddy of the Buller, from her forthcoming double album The Boundary Riders. 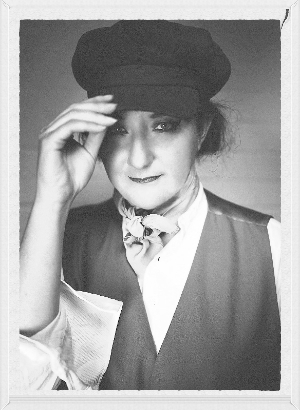 The new lively country single Biddy of the Buller takes the listener on a visual journey through the life of goldminer Bridget Goodwin as she sits smoking her clay pipe confessing her past sins. Recorded live in Katikati with Paul Hoggard, the single features Rachel Dawickon vocals and guitar, Jon Sanders on ukelele, Andy Laking on Double Bass, Dave Khan on violin and Chris Koole on percussion. The forthcoming double album The Boundary Riders and the accompanying 52 page book is a collection of musical tales told through the perspective of a woman following her own journey discovering these hidden voices and bringing their remarkable lives into the public eye. The release is celebrated with a free presentation of the journey at Auckland’s Central City Library on September 19 at 5.30pm and followed by the premiere performance of The Boundary Riders Show with full band at The Vic Theatre in Devonport on the 2 October as part of the Auckland Heritage Festival. Tickets $25/20 are available to purchase at www.thevic.co.nz. The single Biddy of the Buller is available now via Amplifier, Bandcamp and iTunes. Maria Evangelou is a songwriter and performer and is currently based in London. Having been introduced to music from an early age, she decided to follow that path full-time as a way to express her artistic lifestyle and personality. Maria’s upcoming new single Mr Right is an enticing dip back into ‘60s history. It shows off Maria’s Motown, soul and jazz influences and can be compared to the likes of Amy Winehouse, Dionne Bromfield and Duffy. Although soul and jazz are usually considered to be the field allowed only for grownups, Maria effortlessly infuses her music with a mature expressiveness. She is very comfortable slipping on these classic styles like costumes and morphing into them. Her expression combined with the rich, quivering voice and a straight to the point retro production, together create a powerful formula for the perfect summer song. Mr Right demonstrates a modern approach to the legend that is Motown and will be available for sale and download everywhere 8 September 2014. Following their debut release Horizons/Rapture via Blood & Biscuits last year, Brighton psychedelic math-rock three piece The Physics House Band have scored the whole production of Mafia, a play by Sleeping Trees which was performed at the Edinburgh Fringe Festival tonight. Mafia was previously showcased with two sold out performances, one as part of Brighton Fringe Festival and a separate London performance. The Physics House Band are a progressive jazz-fusion band based in Brighton. Their latest record Horizons/Rapture catapulted them to success. 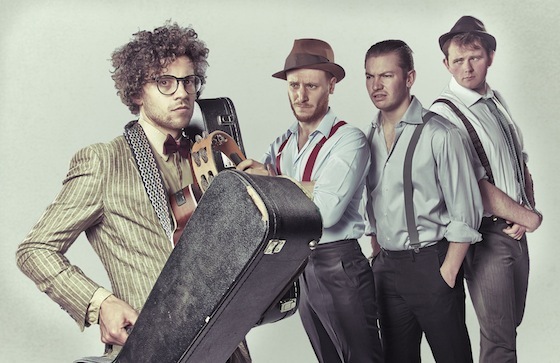 The band have recently returned from a whirlwind European tour and Mafia is their first experience of creating theatre. Sleeping Trees have been making work for the past four years, creating hilarious re-tellings of classic stories without bothering to reread them. They are currently performing The Sleeping Trees Treelogy in Pleasance Below at the Edinburgh Fringe Festival. The two trios have known each other for over ten years and, having found individual success in theatre and music, are excited to join forces to celebrate a film genre they love. They wanted to see what would happen when you put a live score into a comedy theatre show. The result is a hilarious, action packed 50-minutes complete with live sound effects, lashings of hair gel and plenty of Marlon Brando impersonations. Part gig, part comedy show, Sleeping Trees and The Physics House Band combine to make a truly unique show. 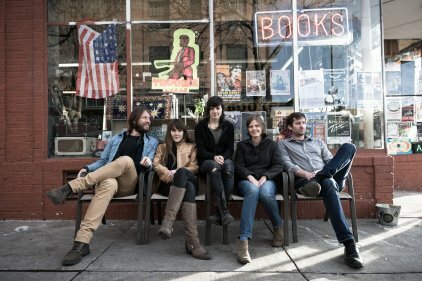 From 2007 to 2012, songwriter Jesse Elliott led rock & roll band These United States through five studio albums and nearly 1,000 live performances in the U.S., Canada and Europe, appearing everywhere from Glastonbury to SXSW, Daytrotter to Lollapalooza and garnering praise from NPR, The New York Times, SPIN, KEXP and others. The Dream of You & Me is the debut record from Ark Life, a new project fronted by Elliott. In early 2013, Elliott stopped in Denver on his way to a new life in New York and started making music with pianist Lindsay Giles, bassist Anna Morsett (of TUS), guitarist Natalie Tate and veteran Denver drummer Ben Desoto. The result was Ark Life, a project that has now shared the stage with Ringo Starr, The Head & the Heart, Ryan Bingham and more. Produced by Eric D. Johnson of Fruit Bats, The Dream of You & Me is made up of equal parts mischief and heartthrob, inspired by the band’s enduring love for CCR, Tom Petty, Motown and the campfire singalong. Ark Life recently premiered What You Want To on Purevolume which is taken from their debut album. What You Want To has some brilliant thought-provoking lyrics, “I should have folded that letter/I should have looked for a phone/I should not smile at these strangers/I should pack up and depart/But the heaviest weight on my heart/Is not what I should do/But what I want to…” What You Want To is a little bit Jackson 5 in places; the tempo, the funk inspired keyboard and the soulful vocals all aid this. What You Want To is a marvellous blend of good and strong mind-opening lyrics, Americana, Folk, Jazz and Funk. Contrasting this upbeat sound, You’re With Me follows What You Want To. You’re With Me is a ballad featuring female vocals to start with in a gospel inspired, harmonic setting. It’s such an angelic beginning to a song making it perfectly beautiful. The harmonies are gorgeous and silky. This track is so simple consisting of vocals and piano with the occasional help from the bass drum or an odd electric guitar chord. It’s a pure song with pure lyrics, “If they ask who snuck you in/Say me baby/If they want to know who took you in/Just say me”. You’ll fall in love with this track – guaranteed. Molly Brown brings the beat back. It’s straight back to the upbeat Americana style. Molly Brown has an addictive melody and feel to it. It’s just a briliant, uplifting number with Elliot’s odd yet attractive vocals. While Molly Brown is uplifting in one sense of the word, She is uplifting in a different way. There’s a very strong rock & roll feel to this track. If you’ve heard Imelda May, whose tracks feature that typical Blues guitar tone, then you’ll probably love this track. She is a little bit like the sort of sound Robert Plant and Alison Krauss brought to the limelight a few years ago with their Raising Sand album. Rock & Roll (Take It Easy) is the perfect ending track to an absolutely magnificent debut album. Ark Life’s The Dream Of You & Me will leave you speechless. You’ll be feeling uplifted, reminiscent, questioning and wondering all at the same time. The lyrics are astonishingly open, clever and worldly while the music is joyful and vintage yet fresh. Ark Life’s The Dream Of You & Me is out on August 19 on Misra Records/Greater Than Collective. Wayne Kramer is asking fans to support his latest idea by pledging via PledgeMusic. Kramer wants to bring his latest record, Lexington, to life and perform it for his fans. But he can’t do this without your support; that’s why he’s turned to PledgeMusic. Kramer said: “My first solo album in 14 years debuted at number 6 on the National Jazz Charts. It’s the most rocking jazz record that just happens to be complete and utter musical freedom. Obviously, I want to bring it to you live. With the help of PledgeMusic, I’m figuring out ways to do just that in this fertile digital (global) landscape. “This is a first for me. My memorabilia has been building up at various HQs since 1966. Through the twists and turns of my life and work, it’s a miracle even this much has survived. I’m putting it out there because I want to connect with you. There are over 50 items from my personal collection that have never been for sale before and there is much more to be revealed when you join the campaign. “Your purchases will bring Wayne Kramer & The Lexington Arts Ensemble closer to your city and bring guitars to some of the people who need them the most — men, women and kids inside America’s prisons who are hoping to change from the inside out. “Want to get some very cool stuff for an even cooler mission? Every pledge comes with a digital copy of the new album, Lexington. Praised across the board for his sophisticated approach to merging eccentric pop, jazz, soul and avant-garde experimentation on Psychic Temple’s 2013 offering Psychic Temple II, band/cult leader, Chris Schlarb, returns with an immersive new LP Making The Saint. “Making The Saint is my new full-length album. “I recorded it inside a cabin in the San Bernardino mountains of California. The owners told me to keep an eye out for ghosts. When I started driving up into the mountains, I didn’t have any new music prepared. I’d just finished an East Coast tour with my Psychic Temple band; six members strong on the road and twelve musicians back at home. A big band for sure. We’d already booked another tour with the guys, all of whom are professionals in their own right. As I drove, I found myself yearning for an intimate, unpolished sound. “Even though Psychic Temple is a big deal, I love small records. When I say “small record,” I think of Sandy Bull’s Fantasias for Guitar and Banjo, Bill Evans trio recordings at the Village Vanguard, Fripp & Eno’s No Pussyfooting or Thelonius Monk’s sublime Solo Monk. Each of these albums is simple. They’re direct. Making The Saint is a small record too. I didn’t belabor it. The recording and mixing came quickly. I followed my instincts. “This album is also a spiritual retreat for me; a healthy and necessary separation after so many strong collaborations. If you’re Sufist, you’d call this khalwa. In Japanese Zen Buddhism, it’s called sesshin. The Santerian process of Asiento requires the initiate to dress in white garments and avoid physical contact for one year. Like so many have done before me, I forced myself into a state of inner solitude to find something new. Making The Saint will be out on May 27 on Asthmatic Kitty. After almost 15 years of friendship, guitarist, songwriter and producer Keaton Simons (Gnarls Barkley, Snoop Dogg, Tre Hardson of The Pharcyde) and experimental drummer, songwriter and producer Deantoni Parks (The Mars Volta, Bosnian Rainbows, T-Bone Burnett, John Cale of The Velvet Underground) have finally come together to form their newest project, Best Revenge. 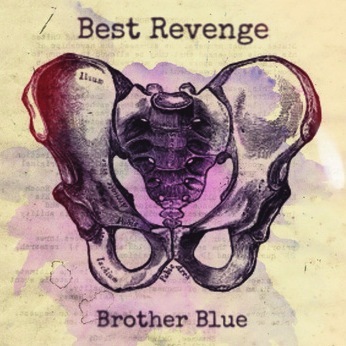 Yesterday, Indie Shuffle premiered Brother Blue, the first recorded song from the duo’s project. Deemed “a triple threat” by his hometown’s Los Angeles Times, Keaton Simons has been captivating audiences for years with his raw, gritty voice, soul-baring songwriting and incomparable, sought-after electric and acoustic guitar work. He’s been brought on as a guitarist, as well as bassist, singer, writer and musical director for such notable acts as Gnarls Barkley, Snoop Dogg, and Tre Hardsonof The Pharcyde. With his own solo project, Keaton has co-produced and released records on major labels, licensed hundreds of songs for TV and film, toured nationally and internationally and performed on The Tonight Show with Jay Leno, The Ellen DeGeneres Show, The Late Late Show with Craig Ferguson and Last Call with Carson Daly. Hailing form Newnan, Georgia, Deantoni Parks is a new wave/avant-garde experimental drummer, songwriter, actor and record producer. He has written, toured and collaborated with T-Bone Burnett, Bosnian Rainbows, The Mars Volta, Meshell Ndegeocello, John Cale of The Velvet Underground, Yoko Ono, Moby, Basement Jaxx and Cody Chesnutt. Additionally, Deantoni wrote and played drums for the Grand Theft Auto 5 original soundtrack and is co-founder of Dark Angels alongside producer and keyboardist Nicci Kasper, as well as a member of KUDU. After meeting almost 15 years ago through jazz/funk trio Soulive, Keaton Simons and Deantoni Parks have not only been close friends but true admirers of each other’s respective work. Best Revenge is the first of what they hope will be many collaborative projects. Fans will have the opportunity to catch them live in Austin, Texas this week at SXSW.